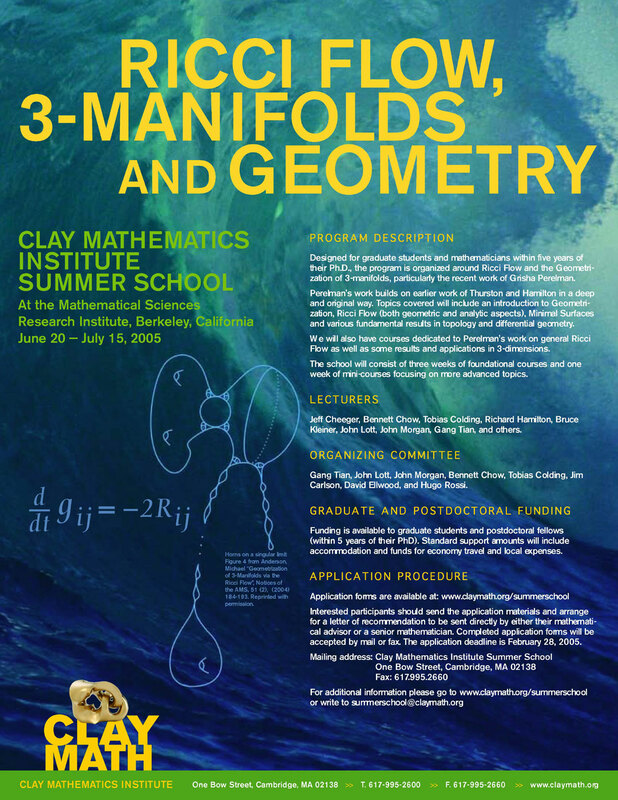 The CMI summer schools are instructional conferences aimed at furnishing a new generation of mathematicians with the knowledge and tools they need to work successfully in an active and important area of mathematics. Buzios, Brazil. Organzied by David Ellwood, Charles Newman, Vladas Sidoravicius, Wendelin Werner. July 11-Aug 2. University of Hawaii at Manoa, Honolulu, Hawaii. Organized by Brian Conrad, David Ellwood, Mark Kisin and Chris Skinner. June 15-July 10. Eidgenössische Technische Hochschule, Zürich, Switzerland. Organized by David Ellwood, Igor Rodnianski, Gigliola Staffilani and Jared Wunsch. June 23 - July 18. Centro di Ricerca Matematica Ennio De Giorgi, Pisa, Italy. Organized by David Ellwood, Manfred Einsiedler, Alex Eskin, Dmitry Kleinbock, Elon Lindenstrauss (chair), Gregory Margulis, Stefano Marmi, Peter Sarnak, Jean-Christophe Yoccoz, Don Zagier. June 11 - July 6th. Georg-August-Universität, Göttingen, Germany. Organized by Jim Carlson, Henri Damon, David Ellwood, Brendan Hassett and Yuri Tschinkel. July 17 - August 11. MSRI, Berkeley, California. Organized by Gang Tian, John Lott, John Morgan, Bennett Chow, Tobias Colding, Jim Carlson, David Ellwood, Hugo Rossi. June 5-26. Rényi Institute of Mathematics, Budapest, Hungary. Organized by David Ellwood, Peter Ozsváth, András Stipsicz, Zoltán Szábo. June 5-26. Isaac Newton Institute, Cambridge, UK. Organized by Alessio Corti, Robbert Dijkgraaf, Michael Douglas, JP Gauntlett, Mark Gross, Chris Hull, Arthur Jaffe, Miles Reid. March 20 - April 18. MSRI, Berkeley, California. Organized by Joel Hass, David Hoffman, Arthur Jaffe, Antonio Ros, Harold Rosenberg, Rick Schoen, Michael Wolf. June 25 - July 27. Pine Manor College, Boston, Massachusetts. Organized by Cumrun Vafa. May 30 - June 25.